1) The first category of credit card to sign up for is the kind that have a BIG signup bonus. These signup bonuses can be worth between $500-$1000 or more. These cards you will most likely cancel prior to paying the annual fee when it comes due. You may even sign up for these cards again in 12-18 months and receive the bonus again! Amex Platinum card that provides airline club lounge access just for having the card. The annual fee on this card is $495. 3) The third and last type of card is the kind that you will use for everyday spending. You may have as many as 5 or 6 of these cards depending on the bonus categories that fit your spending needs. I have one card that pays 2X points on restaurants and travel, and another that pays 2X on Internet advertising. I have another that pays 2X points on gas and 5X points on office supplies, telephone, and cable bills. I can sometimes leverage the 5X spending on that card so that I receive 10-15X points! Miles and points rack up quickly at 10-15X points per dollar spent. Here’s an example of two Dentists with identical practices. Let’s assume that each practice grosses $500,000 annually. For this example we will assume that each Dentist has identical expenses as follows and each Dentist places identical amounts on their respective credit cards, except that Dentist A currently pays his utilities by check. $94,000 is currently being placed on Dentist A’s existing credit cards, $6000 in utilities and $12,000 of personal expenses that are currently paid with cash and checks will be replaced with a 2% cash back credit card. Dentist A has three credit cards in his wallet. One card is a hotel branded card. A second is an airline branded card. The third is a 2% cash-back card. These three cards may be representative of what might be in a typical Dentist’s wallet. We will assume an equal split on the use of the hotel and airline cards with $47,000 being placed on each card. Not bad, but now let’s look at Dentist B. Doctor B employs an aggressive and goal focused miles and points earning strategy to his wallet. Doctor B likes to travel in First Class and stay at Luxury Hotels. 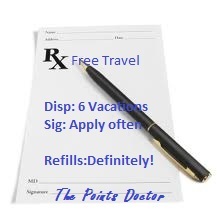 It is critical to Dentist B’s success for him to focus on rewards programs that match his travel needs. In this example Doctor B will apply for 4 different credit cards on January 1st and apply for 4 more on July 1st. I would consider this to be an example of a moderate points earning strategy. Chase Sapphire - 50K sign up bonus and 2X points on restaurant and travel. Chase Ink Business – 50K sign up bonus and 2X on gas and 5X on office supplies. Citi Hilton Reserve- 2 Free weekend nights at any Hilton worldwide. 3 Hilton points/$. Amex Starwood Business – 25K Starwood points bonus. 1 Starpoint/$ generic spending. Amex Hilton – 60K Hilton points sign up bonus. 3 Hilton points/$ generic spending. Citibank AA – 50K AA miles sign up bonus. 1 mile/ $ generic spending. Citibank Business AA– 50K AA miles sign up bonus. 1 mile/ $ generic spending. Doctor B has developed a card usage pattern that maximizes certain bonus categories of spending. Doctor B will spend the same $112K that was spent by Doctor A, but receive a much different result at the end of the year. Citibank Hilton- $40K in lab bills (generic spend category) = 120K Hilton points plus two free nights from the signup bonus. You will receive Hilton Diamond status, which provides access to preferred rooms, suites, club lounge and free breakfast and Internet. Amex Starwood Business- $25K in dental supplies plus $5K in lab bills yields 55K Starwood points (25K bonus+ 30K) and qualifies you for Starwood Gold status. Chase Hyatt- You receive 2 free nights with your first purchase. (a $1 purchase would qualify). This card gives you Hyatt Gold Passport Platinum status as long as you own the card and pay the $95 annual fee. Total Result of Dentist B Spending the same $112,000. Two Free Hyatt nights any Hyatt hotel worldwide and Platinum status. Using a focused credit card strategy and applying for multiple cards will have little effect on your credit score in the long term if properly executed. The travel benefits can be extremely rewarding. How do you keeps all these cards straight? If you have 10 cards in your wallet, how do you remember which one to use when esp when you are canceling and reapplying for cards frequently? Jay. That is a great question. As far as which cards to use, I take a Sharpie and write on the card something like "gas/OS" for gas and office supplies or "R&T" for restaurant and travel. This is especially helpful to my wife. She goes along with my insanity, but only to a point. Lol. At any one time, I may only have 4-5 cards actually in my wallet. That is a combo of business and personal cards. You do need to keep excellent records of when minimum spend has been met and when to cancel certain cards. I have an app in my phone that stores all the usernames and passwords. In the remarks section I keep notes about those things. The app is called eWallet. How do you go about using the Visa gift cards to pay for utilities? Id love to pay my $5,200/mo rent and get points on it. bluebird account. I will be posting on the bluebird account in the next couple of days. If you subscribe to the blog, then you will be notified as soon as that info is posted. bluebird is the new killer app in points earning, allowing us to earn points on items that we have not been able to earn points on in the past.